Growing up, Jason had one dream – to serve as a Phoenix Police Officer. Inspired by his brother and the tragic loss of a local law enforcement hero, Jason worked persistently towards his dream. After serving four years in the Air Force, at the age 26, Jason achieved his goal to work on the streets of Phoenix as a rookie police officer. Then, only 14 months into what was supposed to be a life-long career, Jason’s life took an unexpected, dramatic and, at the time, tragic turn. On the night of March 26th, 2001, a taxi cab crashed into the rear of Jason’s patrol car. Upon impact, Jason’s car burst into flames, trapping him inside with temperatures reaching over 700 degrees. Through a series of miraculous and fateful circumstances, Jason survived the crash and ensuing physical and emotional catastrophe. He suffered severe burns to over 40% of his body which drastically altered his appearance. He has undergone more than 50 surgeries just to have the ability to accomplish simple daily tasks we often take for granted. 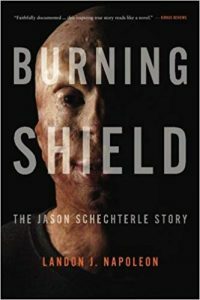 Jason’s journey chronicles his fight for life, his triumph over tragedy and the inspiration that enables him to continue to overcome unimaginable adversity. His personal narrative exemplifies that the power of the human spirit can never be underestimated or extinguished. His story is also a testament of true love and the dedication Jason and his wife have in their commitment to honor their family and the vows of marriage in good times and bad. His story is one of life, rebirth and transformation. Jason represents the human experience at its very best – an ascent from despair to describing himself as the luckiest person alive!